I imagined myself strolling in the big city of New York while the curls in my afro sway in the wind. My vibrant Sunkist orange lipstick drawing attention as I saunter to class. On days when I am in a rush after gobbling up every Scandal tweet and re-tweet on Scandal Thursdays, I’ll sport my head wrap and a long flowing dress with boots to combat the winter weather. I saw myself sporting my Spelman hoodie and singing the praises of my glorious institution no matter the occasion. So I did it. Without hesitation, I signed up for a fall 2014 Domestic Exchange at Barnard College. When asked why I applied, I would reply, “You must leave your surroundings in order to appreciate them.” This paradoxical tidbit, has always fascinated me. It also seemed like a succinct quote giving the impression to others that I am well beyond my years. 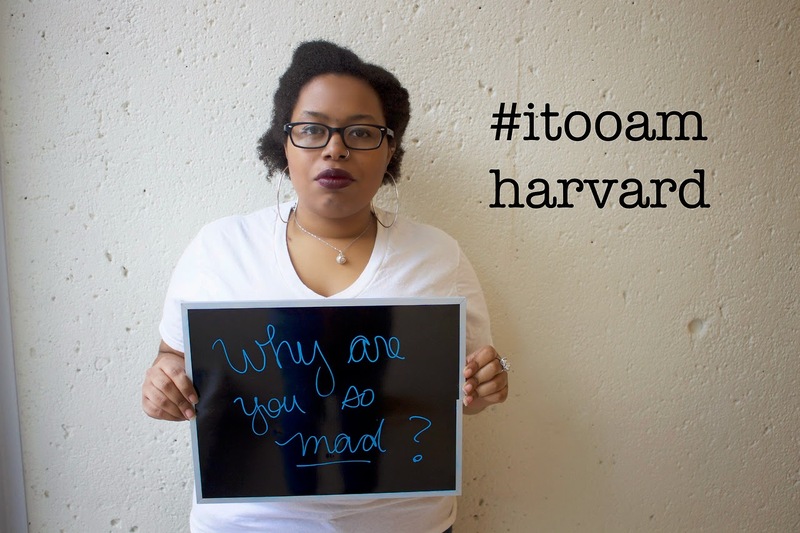 One afternoon while making my rounds on my favorite blog sites, I stumbled across the I, Too, Am Harvard campaign. Young students of color attending Harvard expressed their frustrations using video and white boards to debunk stereotypes about people of color. In doing so, they expressed their frustration with their lack of inclusiveness in the Harvard community because of their skin. These students discussed misconceptions and stereotypes related to the anger of black women, hip-hop culture, and their financial status. The videos and photographs made me ponder which prejudices and assumptions would be made about me. Rather, I learned I would have to be cautious of my surroundings in a way that will frighten me. It had not occurred to me that although Barnard is a sisterly place, everyone might not be my sister because of my ebony hue. Perhaps, I was naïve or maybe just excited to embark on the exchange. In retrospect, the exclusion of black women from the feminist movement due to racial prejudices and the implications of socioeconomic status apparent in human interactions should have been major clues. While these reservations exist, the campaign ignited a greater affection for my institution dedicated to women of color. I now understand that I cannot take roaming freely down the hallways of my dorm in a tattered satin bonnet for granted. I now appreciate the ease with which I can conduct lengthy natural hair rituals without curious eyes. I adore not having to explain that my hair did not grow overnight; I simply got braids. I love that my anger is not simultaneously hypervisible and invisible at Spelman. It is recognized. I am recognized. I intend to go to Barnard College and leave more proud of my institution than ever before. I will choose to walk with an informed openness. I will be open, yet informed of my surroundings.